Cathy Palmer received her B.F.A. 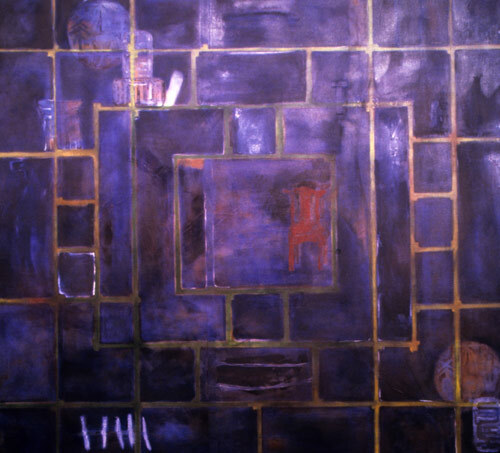 in Painting from the University of South Dakota in 1995. Today, she is living and working in Sioux City, Iowa. Her work has been seen all throughout Iowa. About her work, Cathy writes, "These paintings—through layering, destroying, seeking and renewal—are trying t capture the vibrant feeling of nature and its innate spirituality. There is evidence of struggle, while striving to maintain a feeling of spontaneity and soul. The mystic language of color and abstraction is paramount because of its embodiment of things non-limiting and mysterious." This page was first published on January 29, 2006.